London has been lost to the undead plague. Overrun by hordes of mutated zombies, the last hope rests in the united fists of four lone outcasts. Using their brutal combat skills to survive in their new world, they must form a fragile alliance to smash, slash and brawl their way through the undead horde and save what is left of their broken city. Accessible yet deep freeform combat. Combine moves to discover brutal, endlessly chainable combos. Unlock upgradable special moves and passive skills to expand your zombie-slaying abilities. Unite with friends online and locally, with or without a VR headset. Work together to tear through the undead hordes, while competing for the highest score. VR’s enhanced viewpoint allows you to assist other players -- lean in and look around to overcome obstacles and give tactical support. Choose from four survivors, brought together to fight the zombie plague: Teller, Mick "The Brick," Rei, and Eddie. Customize each character’s skillset and wield a destructive arsenal of melee weapons. Take on a diverse plague of zombies, with loads of deadly mutations and abominable bosses to contend with. Learn to change tactics to match your foe and survive! Work together across the diverse, overrun zombie wasteland. Fight your way through the remains of iconic London streets and landmarks to take back the city. Levels are overrun with secrets and events to discover. Bloody Zombies is a co-op brawler designed to be played with any combination of PS4™ and PlayStation®VR players. Fight across the ruins of London using carefully refined Free-Form Combat, taking down a terrifying variety of undead with an expanding special move-set. 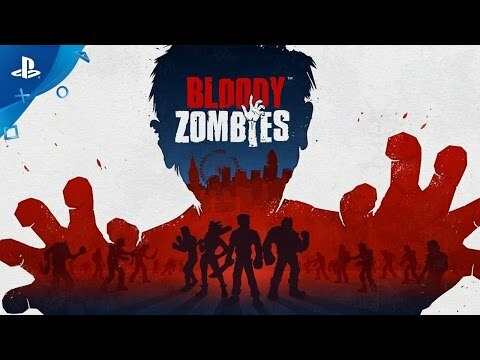 Created for one-to-four players, Bloody Zombies is also enhanced with PlayStation®VR -- using its unique viewpoint to help the team overcome obstacles and discover secrets in the game.